Ever wonder how you can give thanks on Twitter? Our guest blogger, Mark Miller of Children's National Medical Center (@childrenshealth), recently ran a campaign called #thankathon. Check it out. In its most recent survey of North American donors, Cygnus Applied Research found that as many as 65 percent of first-time donors never make a second gift. Why? Partly because they are not thanked in a prompt and meaningful way and because nonprofits ask for additional gifts before telling donors about the impact of the original gift. Retaining a donor is more cost-effective than attracting a new one, yet many nonprofits are not doing what it takes to keep donors engaged with their cause. With these principles in mind, Children’s National Medical Center launched a week-long “thank-a-thon” on Twitter during the week of Thanksgiving. There was no ask, and no call to action – just a simple thanks. From Nov. 22 to 26, we posted 20 messages thanking 80 partners – corporate donors, sports teams, media partners, and others who have given gifts or helped raise money for children and families at our hospital. The simple goal of the campaign was to show these partners we appreciate their involvement, but it had several additional benefits. Many influential people and organizations retweeted or replied to our messages – including Walmart (@WalmartCAN), Lexus (@Lexus), Hyundai (@Hyundai), and Ace Hardware (@AceHardware). David Gregory (@davidgregory), host of NBC’s “Meet the Press” and a Children’s supporter, shared our message with his 1.4 million followers. Because of those replies and retweets, we gained several hundred new followers and gained more visibility for these valued partnerships. 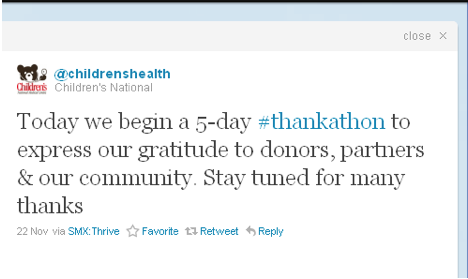 How are you using social media to thank and engage your donors? Mark is the director of philanthropic marketing and communication for Children’s National Medical Center, where he leads communications efforts to support fundraising. He volunteers with Autism Speaks and the American Special Hockey Association. He has held senior positions at the Case Foundation, the White House, AmeriCorps, and Weber Shandwick.